SUBHEAD: Ten activists are in jail for shutting down all tar sands pipelines entering the United States. 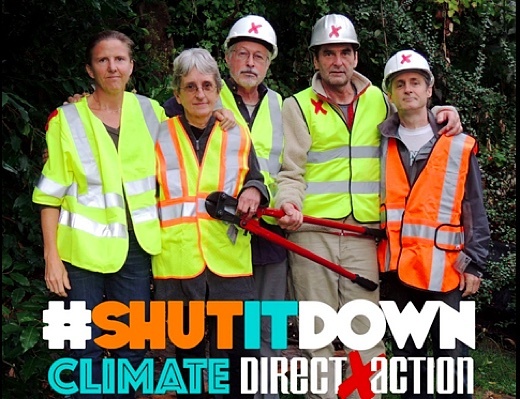 Image above: Some of the activists involved with shutting down the tar sands pipelines for #ShutItDown. From original article. 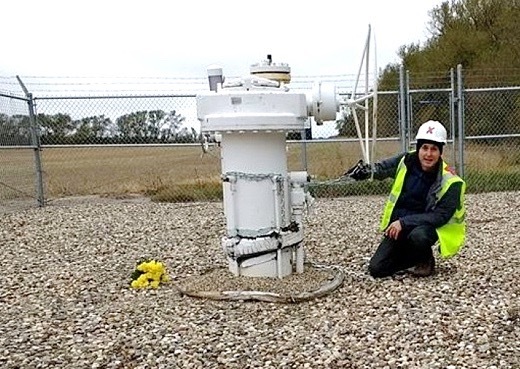 The activists employed manual safety valves to shut down Enbridge's line 4 and 67 in Leonard, Minnesota; TransCanada's Keystone pipeline in Walhalla, North Dakota; Spectra Energy's Express pipeline in Coal Banks Landing, Montana; and Kinder-Morgan's Trans-Mountain pipeline in Anacortes, Washington. The activists, who planned the action to coincide with the International Days of Prayer and Action With Standing Rock, expressed feeling "duty bound to halt the extraction and combustion of fossil fuels...in the absence of any political leadership" to address the withering goal of keeping global temperature increase beneath the 2°C climate threshold. "I have signed hundreds of petitions, testified at dozens of hearings, met with most of my political representatives at every level, to very little avail," said 64-year-old mother Annette Klapstein of Bainbridge Island, Washington, who was arrested just before publication. "I have come to believe that our current economic and political system is a death sentence to life on earth, and that I must do everything in my power to replace these systems with cooperative, just, equitable and love-centered ways of living together. This is my act of love." Fifty-nine-year-old Ken Ward of Corbette, Oregon, who was also arrested, said, "There is no plan of action, policy or strategy being advanced now by any political leader or environmental organization playing by the rules that does anything but acquiesce to ruin. Our only hope is to step outside polite conversation and put our bodies in the way. We must shut it down, starting with the most immediate threats—oil sands fuels and coal." The action comes two days after a U.S. federal court of appeals lifted an injunction on the Dakota Access project, to the dismay of the Indigenous water protectors and their supporters across the U.S. and Canada. "Because of the climate change emergency, because governments and corporations have for decades increased fossil fuel extraction and carbon emissions when instead we must dramatically reduce carbon emissions; I am committed to the moral necessity of participating in nonviolent direct action to protect life," added activist Leonard Higgins, 64, from Eugene, Oregon. The activists are all members of the group Climate Direct Action, which is providing live updates on the coordinated shut-downs on its website and Facebook page. Others shared statements in support, as well as images and videos of the actions on social media with the hashtag #shutitdown. Tim DeChristopher's Climate Disobedience Action Fund is also supporting the action and has set up a legal fund for the activists' defense. Image above: Michael Foster, 52, pictured here, said, "All of our climate victories are meaningless if we don’t stop extracting oil, coal and gas now." From original article. Is Deep State tanking Hillary? How far will North Dakota go? Amy Goodwin to face "Riot Charge"
How about a "Grown" economy?